Its not raining, Its flooding Government Jobs in J&K. The Last two months were extra special for those who have been looking for Government Jobs in J&K. Banks, Government Departments and Recruitment agencies, all look in a hiring spree and it is expected that this Massive Recruitment in Govt. The sector will go on for quite some time in future. Talking about Government Jobs, In this Last few weeks, there have been vacancies in J&K Fisheries Department, Range Officer Posts in Forest Department of J&K etc the List is endless, but not complete if we don't mention the Bumper JKSSB Teacher Recruitment 2018. 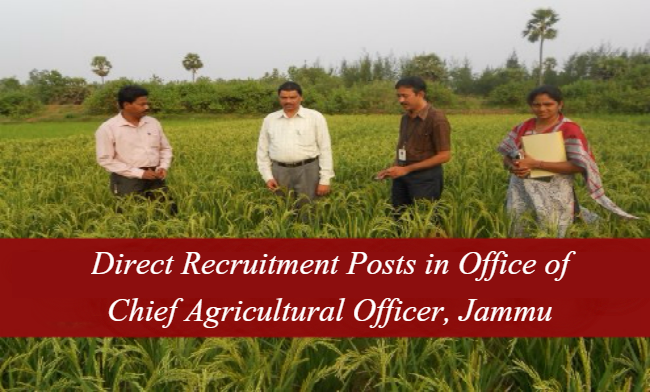 Today, we are here to share with you the Latest Post and vacancies, advertised by the Office of Chief Agricultural Office, Jammu. These vacancies are contractual in nature and applications are invited for a Special Project under Centrally Sponsored ATMA Scheme. In case you missed, checking the Newspapers on 27th March, 2018, then Don't worry we have the Full Advertisement and next what we are going to do, is to share the Complete Details of Latest vacancies advertised by J&K Agricultural Department Jammu. Now, its time for Jobs in Sher-e-Kashmir University of Agricultural Sciences and Technology (SKAUST) Jammu. If you are government Job seeker, then this is a good time, as there are flood of openings in the Government Sector. Getting a Government Job in J&K is a dream for many, but the level of competition is sky high, that for a Single post, thousands of applicants are there. The plus point of a Government Job in J&K, is that you will get Jobs in your Home town, along with good perks and Salary. In our previous post, we have shared the Details of vacancies advertised by the Offiice of Chief Agriculture Office, Jammu and Today, in this post, we are going to share the vacancies in SKAUST Jammu. It is worth mentioning here that SKAUST had advertised 56 various vacancies for its campus located in Jammu. The various Jobs includes Officer Level Posts, Non-Gazetted posts and Class IVth posts. So there is opportunity for everyone, irrespective of your Qualification. Remember, If you have not yet applied for Jobs in SKAUST, then apply early as the Last Date is 1st June, 2015. Jammu University had announced the much awaited Dates of Jammu University Entrance Test (JUET-2015). JUET is conducted by Jammu University once in an year, in the month of June. In 2015, Jammu University Entrance test (JUET) will be held on 25th June, 2015. It is worth mentioning here that JUET is the Common Entrance test for taking admissions in the Post-Graduate and Undergraduate Courses offered by Jammu University. Those who make it to the Merit List can take admissions in various UG & PG Courses for academic session 2015-16. JUET is only a Screening test, and marks obtained in this test, will be not serve as a ranking factor to get the admissions. Applicants who pass the JUET-2015 (Screening Test) , will be given admissions for the UG / PG Courses only on the basis of their academic merit. The Participating Institutes in the JUET-2015 is Jammu University, Offsite Campuses of Jammu University and Other Colleges affiliated with Jammu University. In this post, we will share the Complete Details regarding the Jammu University Entrance Test-2015. The Notification regarding the JUET-2015 is released online on the Official Website of Jammu University and for offline users the JUET Notification is published in the Local Dailies of J&K including the Daily Excelsior.